pictures. Look at the cover and ask the children what they think the book is about. Read the title of the story and the name of the author. Tell the students a little about Lois Ehlert and how she came to write the book "Snowballs" and, more importantly, how she decided to illustrate it. She grew up in a home in which her mother was a seamstress and shared her fabric scraps with her, and her father had a basement workshop with all kinds of scraps that she could use. Lois drew and painted but found that she much preferred to cut and paste. Ask the students how this fits with the picture they see on the front cover. This lesson helps to build listening and comprehension skills through discussion during and after sharing the book. It also incorporates play-acting, movement, and appreciation of the wonderful pictures. After reading the book, and looking very carefully at the illustrations, ask the children if the story reminds them of something that they made – either a snowperson or a picture made from scraps. Ask them to describe their favorite picture in the book. What "found" objects were used? Discuss with the class whether this is fiction or non-fiction. Look on the back cover of the book and read the various weather forecasts. Provide a copy of a local newspaper and read the weather forecast in it. Listen to a weather announcement on the radio, or watch one on T.V. On chart paper ask the students to help make up a weather announcement for today's weather. Remember to forecast later in the day and for the next day. Then ask for volunteers to read the forecast in the manner of a weather reporter. As a follow-up ask for volunteers to pretend to be weather reporters outside and make up their own reports. Provide a plastic microphone, hat and jacket. Invite students to stand in a circle. Explain that they are snowpeople. Ask them to move around as if it is very cold and they are having a very jolly time. Using your voice or a tambourine tell them that the sun is coming out and that it is getting hotter and hotter…and that they are melting into a puddle on the floor. 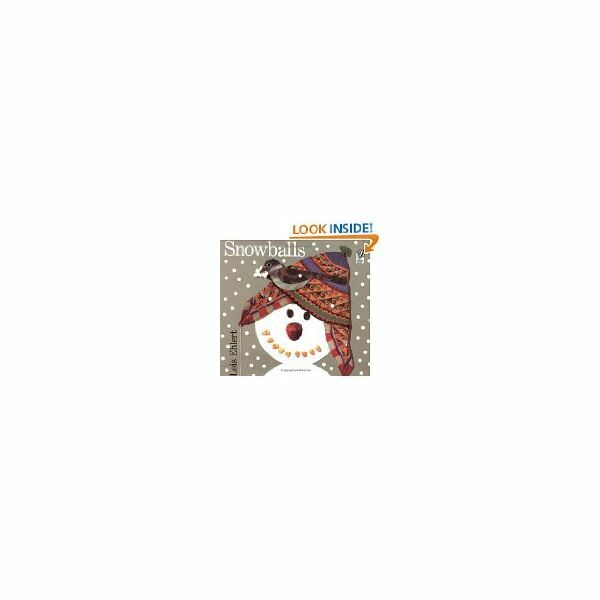 Play the song "Frosty the Snowman" and invite students to move around and pretend to be Frosty. Suggest to your students that you are going to make a rap to go with the book and that it will become part of the lesson to share with future classes. Young children love to hear that their work will be used to inspire others. We will share with you today……..
Continue with the students volunteering a line and you adding the second rhyming one. When you have completed the rap ask the students to clap the beat and read in rhythm. "Snowballs" is a simple story but the colorful and charming pictures will keep your young students fully engaged. Older primaries will also enjoy this book as they examine how they, too, could make wonderful pictures from "found" objects.